The souring relation between Uhuru Kenyatta and William Ruto has taken a dramatic turn with reports that a Stop-Ruto-Movement group is now domiciled at Harambee House with express directive to embark on a smear campaign targeting the former Eldoret North MP. Ruto has been against the referendum that Uhuru supports in the machination that it is going to avail him a political lifeline to succeed himself as number one but as executive prime minister this time round. According to well versed sources, the anti-Ruto forces are out to isolate him in the coming weeks as the push for the referendum gains momentum. Already, Uhuru has been briefed accordingly that Gatundu South MP Moses Kuria and his Bahati counterpart Kimani Ngunjiri, who are allied to Ruto, are being used by DP strategists to paint Uhuru in bad colour and remind the president he had neglected his home turf – Central and the entire Mount Kenya to lay grounds and ignite Ruto to make inroads in the region, officiating development projects to make locals see Uhuru as deadwood. Last week, Harambee House coordinated and oiled press conferences across the political divide by women leaders, Coast, Central province leaders in support president of Uhuru and Raila Odinga’s handshake. To show that powerful Uhuru handlers are for the referendum, the women wearing T-shirts with words Embrace supported the so-called Building Bridges team. Central province leaning governors and politicians went further to defend Uhuru development record to the core. In the front line of the stop Ruto campaign is former Jubilee Party vice-chairman David Murathe, who has vowed to mobilise, as much as everyone sees this as delusional given that Murathe can not influence even his next neighbour in Gatanga where he long gave up hope of being elected, the ruling party supporters to quit the party enmasse, and thus leave the DP with a shell. Insiders at the corridors of power intimate that since the last cabinet reshuffle, where the DP’s close allies were either dropped or posted as ambassadors in faraway countries, Ruto has become a stranger in State House who rarely gets to know what is happening unless invited. Uhuru has decided to be close to Raila as he keeps on isolating his second in command. In fact Uhuru decision to visit Raila Bondo home and attend his 74 birthday party in Nyali is part of the psychological war. Remember ever since Jubilee won second term, Uhuru has never visited Ruto’s Sugoi home or even his private Nairobi residence. When Uhuru and Raila had lunch with Ruto together with billionaire Jimmy Wanjigi, it was at DP’s government Karen residence. Aware that Uhuru and Raila had pitched tent in Mombasa and with word they were consulting on cabinet reshuffle, Ruto avoided Mombasa despite being expected and chose to operate in his Karen and Sugoi homes receiving delegations. He did not attend a function in Mombasa where Uhuru and Raila commissioned the Mama Ngina Water Front Park. Ruto was bitter Uhuru did not attend his doctorate graduation party that also marked his birthday at his Karen residence despite being invited as the president spent time with Raila, and even attended a mere birthday celebrations where he joined the ODM leader and his wife Ida in cutting the birthday cake as their staff, and other politicians looked on. Some Kenyans on social media made snide remarks saying it is no wonder Central is complaining of having no development if the president is this idle. Initial reports indicate that Uhuru wanted to skip Ruto’s graduation ceremony at University of Nairobi but changed his mind and attended. After the graduation, the DP threw a party that was attended by his political allies that ran till late at night with food and drinks flowing freely. Many had expected Uhuru to attend with First Lady Margaret Kenyatta to keep Ruto’s wife Rachael company but it never occurred. Ruto’s sour relation with Uhuru began when the head of state named his cabinet after the controversial repeat presidential election on October 17 last year. 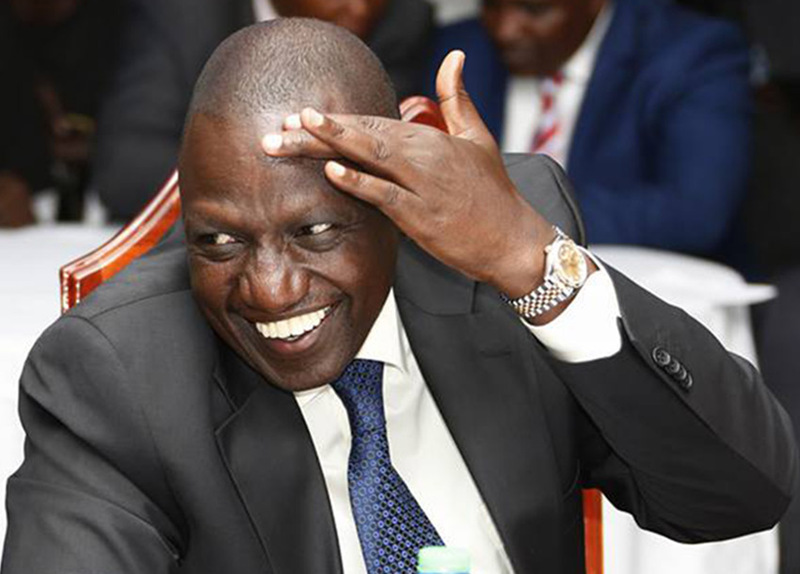 Ruto was bitter that Uhuru had taken the powerful Agriculture docket which was in hands of URP wing in the first Jubilee cabinet from Kalenjin land to Kikuyu region when Agriculture was key in Rift Valley. Further, what annoyed the DP most was the split of strategic Energy ministry into two – that of Energy and Petroleum that was initially one and held by his ally Charles Keter. Uhuru repeatedly used more of “I” rather than “we” which basically meant the decisions made were his and not collectively with his deputy. He even went ahead to quote a section of the constitution “powers conferred in me by the constitution” unlike in 2013 when he used “me and William”. The first blow to Ruto was the appointment of former Nakuru governor Kinuthia Mbugua to State House, a man he does not see eye-to-eye with. Mbugua’s appointment almost led to fallout between Uhuru and Ruto and matters were made worse by the elevation of the former Administration Police commandant to State House as comptroller. Mbugua was elevated after Uhuru demoted then State House comptroller Lawrence Lenayapa and dispatched him to Netherlands as Kenya’s envoy. Lenayapa had been Ruto’s man at State House and used to spy for him, briefing him on who the president was meeting and the nature of the talks. Next on the line was then State House spokesman Manoah Esipisu who was replaced by television journalist Kanze Dena. Esipisu, according to sources, was leaking secrets to Ruto in exchange for handouts. He was posted to Britain as Kenya’s ambassador. Next on the line were the directors of the Presidential Strategic Communications Unit, who had twice been kicked out of State House only to make a comeback on Ruto’s intervention. They were also DP spies. Some of them were ordered to vacate the House on the Hill and are now stationed at the William Ruto’s Harambee House Annex office. Those at Harambee Annex include Munyori Buku, Dennis Itumbi, Eric Ng’eno, James Kinyua and Munira Mohammed. Signs that there is no hope of ever returning to State House began to emerge after some of them opted to instead align themselves with influential cabinet secretaries and parastatal chiefs. Last to feel the heat was Jomo Gecaga, who is the president’s personal assistant. Most of his duties have been taken over by Mbugua. Though still stationed at State House, Jomo today has no influence on who sees the president. Jomo is a close confidante of the deputy president. Insiders say Murathe whom some say is a proxy of Peter Kenneth is now putting put a secretariat with the sole mission to bring down the deputy president. Already, he has started hiring propagandists to do the dirty work and also enlisting services of some intelligence figures in the scheme to research on Ruto’s skeletons. The vicious Uhuru succession war took a nasty turn last week following claims leaked by his opponents that the DP has amassed Sh410 billion war kitty he intends to use to buy about 129 MPs to resign so as to force a snap general election. This came to the light after Kuria, a close ally of the DP, cancelled a press conference at the eleventh hour where his confidantes had told the media he would announce his resignation. A day later the vocal MP while distancing himself from the resignation reports said he has good working relationship with Uhuru. Kuria, recorded a statement with police claiming powerful individuals in the corridors of power were planning to kill him. His contact person, Josiah Murigu, a former photojournalist at Medimaxx and an aspirant for Kirinyaga Central parliamentary seat, had said Kuria would announce his resignation as Gatundu South MP to concentrate on drumming up support for Ruto in Mount Kenya ahead of 2022 elections. Murigu is not new to controversy as he is the leader of a lobby group, Empowering Africa Through the Media, which unsuccessfully filed papers in the murder trial of TV journalist Jacque Maribe seeking to be enjoined. The petition was however dismissed by Justice James Wakiaga. Murigu enjoys close links with a section of the Jubilee establishment and State House officials including Itumbi, who is now said to be working for Ruto. Interestingly, Maribe’s lawyer is Katwa Kigen who also represented Ruto at the International Criminal Court in The Hague, Netherlands. Kuria, according to sources, was threatened with criminal prosecution over misappropriating millions of shillings from the Gatundu South National Constituency Development Fund. The theft is well documented in the latest report by Auditor General, Edward Ouko. The report notes that Kuria coerced AIE holder David Murungi, accountant, Jackline Wasilwa and chairman Robert Kibe to channel funds to ghost projects. Over Sh20 million disappeared into thin air, with no explanation from Kuria. The auditor also raised queries on Sh596,800 spent on sports projects where a company associated with the MP, allegedly supplied 107 of Mikasa balls and 30 pieces of goal post nets which were allegedly supplied a day before the quotations were opened and evaluated. The report has since been forwarded to the Directorate of Criminal Investigations for action. Sources say after Kuria clarified that he was not resigning, he in the evening met Uhuru’s Mr Fix It, Deputy Chief of Staff Njee Muturi and Murathe and told to avoid Ruto camp. Kuria even talked to Uhuru using Muturi’s mobile line in Kikuyu. In fact it is said that Murathe even had a word with him at the sitting. It is said that it is Uhuru who told Murathe to resign as Jubilee vice-chairman after a bitter Ruto called the president asking whose interest Murathe was pushing in undermining his 2022 presidential bid. Kuria is not alone in stoking fire in Jubilee as Bahati MP, Ngunjiri has been accused of getting bribes from Ruto to launch an offensive against Uhuru’s development record in Kikuyu dominated Rift Valley. Last week, the Bahati MP took a walk of defiance in the streets of Nakuru town clad in a white T-Shirt emblazoned ‘Mimi Ni Mshenzi’, accompanied by his supporters. This in reference to Uhuru’s shenzi insult to those complaining that Central has gotten a raw deal from his presidency. Later, he was at pains explaining that those making allegations Ruto is bribing them to discredit Uhuru are political orphans and are using the current turbulence in Jubilee party to make a political comeback. He was referring to Narc-Kenya Martha Karua and former Gatanga MP Kenneth who hit at the MP saying he was being sponsored to blackmail Uhuru. Both Karua and Kenneth unsuccessfully contested for the Kirinyaga and Nairobi governor’s seat but lost to Anne Waiguru and Mike Sonko respectively. Kuria and Ngunjiri have also been censured by a caucus of Mt Kenya leaders led by nominated MP Cecily Mbarire. In a press briefing, the Mt Kenya leaders defended Uhuru saying he is president of the Republic of Kenya and deserves utmost respect from all Kenyans, more so, those elected under his party. Their electorates have however dismissed the caucus and expressed backing to Kuria saying if Mt Kenya has gained, it must be the pockets of the caucus members only. But it is the online campaign targeting Ruto that has spilled over to other media outlets, social, print and electronic, that is likely to change the political direction ahead of 2022. Similar to the campaign that veteran editor Phillip Ochieng spearheaded under the cover of Jeremiah Araka in early 1990s while working for the then ruling party Kanu-owned Kenya Times newspapers, targeting opposition figures who included Jaramogi Odinga Oginga, Mwai Kibaki, Kenneth Matiba and James Orengo, the pro-Uhuru-Raila camp has put into motion schemes to discredit Ruto’s character in the public eye. Roped in the campaigns are lobby groups affiliated to the Jubilee Party. One of them is dubbed Mount Kenya Youth Caucus chaired by Linford Mutembei while the other is Vijana Tuko Pamoja led by Geoffrey Muya, a team member of Uhuru 2017 and 2013 campaign teams. The groups have started releasing filth ostensibly linking the DP to numerous scandals and describing him as a man unfit to lead Kenya. Murathe is believed to be the brains of the campaign and has roped in resource persons including some drawn from state security systems. One of the documents titled ‘Sugoi Exposed: Masaibu ya Sugoi na Bwana Tangatanga,’ claims that Ruto’s Sugoi home was a proposed settlement scheme for Emo Group (Keiyo Welfare Group). The land was to be bought off from Chakeer (Indian owner) under guidance of a respected businessman. However, the deputy president forced himself into the Sugoi land that was to be sold to squatters in small chunks. Another campaign points out that any deputy who dares rebel against his boss stands no chance of elevation to the highest seat. It accuses Ruto of allowing and financing his allies to undermine the president. In another document, the pro-Uhuru-Raila camp argues that the campaign against corruption is meant to widen the rift between the president and his deputy, who has been adversely mentioned in several newspapers and tabloids as a corruption czar. The document notes that the aim of the Tanga tanga team is to discredit Uhuru in his own Mt Kenya backyard so as to make him lose face, and if the worst comes to be, booed in his backyard. The main thrust of this plan is to blame the president for the apparent lack of development in the region. The war is not being waged in parliament where it can be muted easily but in Tanga tanga territories such as public rallies, funerals and fund-raisers. Remember at one time he accused his Sports cabinet secretary Rashid Echesa allied to Ruto for using funerals to attack anti-Ruto forces at the expense of development. The speakers at these events are familiar faces including Kuria and Ngunjiri. They are mostly in the company of Ruto or his associates. Some of the MP who had been getting handouts from Mburu include Ngunjiri, Kuria and Kiharu MP Ndindi Nyoro.